Last Wednesday of every month, 8pm. 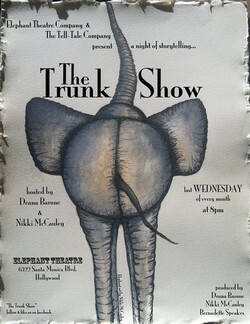 Elephant Theatre Company & The TellTale Company present a multi-genre storytelling night. Six storytellers. Stories told in all fashions, on theme. Last Wednesday of every month. 8pm at the Elephant Stages. Hosted by Deana Barone & Nikki McCauley.